Let me start by saying thank you to everyone who worked so hard preparing for our thanksgiving services. At some point I ought to write a Nehemiah-style list of all the folk who worked to get the building into a fit state for us to welcome our guests. But I’ll leave that until everything is finished; we’ve still a few jobs left before we can say that our building work is done. For the moment I’ll simply record our gratitude to all who have played a part thus far. Some of you, I know, were down at the building evening after evening in the run-up to those services, working till all hours. I don’t know if what was true of Nehemiah’s men was true of you: “we laboured at the work from the break of dawn until the stars came out… none of us took off our clothes, each kept his weapon (or his paintbrush) at his right hand…” but it wouldn’t surprise me. But of course, it wasn’t just the building work. We had all the publicity work to do as well. Five and a half thousand leaflets to be distributed during those last two weeks – the biggest leaflet-drop we’ve ever done. Some of you were out leafleting up to the very last moment – an hour before our last service was due to start. And then there was the catering – altogether we served more than a hundred and sixty meals over the two weekends. All honour to the ladies who planned and prepared. And then there was all the time and effort that you put into personal invitations. Some of you visited lots of friends, wrote dozens of letters or cards, all with the aim of persuading people to come and hear the gospel. 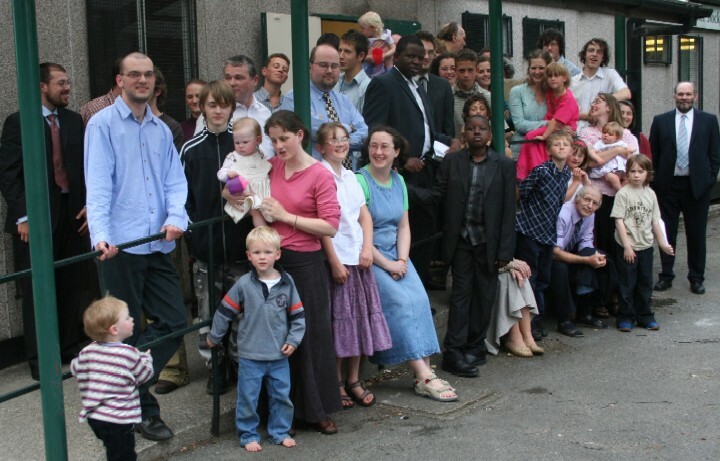 And of course alongside all this extra, special effort, there were all the ongoing activities of the church to be maintained – the Lord’s Day services and the Sunday-school, the prayer meetings and Bible-studies, the nursing home services and the lads’ group, the missionary meetings and the ladies’ group. Our members who live in Charlesworth had to carry on their services, their prayer meetings, their outreach. Some of you continued to travel over to Runcorn to support the work there. And you still had to earn your bread in your places of employment. And care for your families and teach your children. You had to maintain family devotions and private devotions. You had to find time for your own walk with God. Yes, they’ve been exhausting weeks. And was it worth it? In human terms, who knows? Who can tell what the long-term outcome will be of all the effort we put into those special services? What we can say is that our profile in the area has been raised very significantly. Our local councillors, our MP, the headteachers of our local schools, the local doctors and police chiefs are aware of us. Some of those folk have crossed our threshold and have heard just what we stand for, and why. Many other people have noted our leaflets – some have phoned us wanting to know more. Maybe neighbours have come up to you – as they have to Anne and myself – and said, “we saw your photo in the leaflet!” We’ve had more visitors over these past weeks, listening to the gospel, than for many a long year. All this has given us a momentum. We have contacts to follow up. People who half-promised to come to meetings but didn’t get there may respond to a second invitation. We can capitalise on the interest that’s been stirred. An elderly couple whom I had invited rang me two days before our final service to apologise for the fact that they couldn’t be there. She had just come out of hospital and was still shaky on their feet. But they shop every week at Morrisons. Next time they’re there, they’d love to see the building properly. So I’ve promised them a personal tour, along with a coffee and sticky bun. Any other older folk who shop regularly at Morrisons and who might want to join a coffee-and-sticky-bun-club? As I look back over these weeks, I’m vastly encouraged. We’ve seen many prayers answered, old wounds healed, new opportunities opened up. I’m hoping and praying that in months to come, we will see a great return on all the labours of the past weeks. But if not…? Does that mean that our labours have been in vain? How could they be? Surely, no work done out of love for Jesus Christ, in obedience to his commands is ever wasted. “God is not unjust; he will not forget your work and the love you have shown him…” (Hebrews 6:10). We may not get the rewards we long for here in this world. But the Lord Jesus has promised that there will be everlasting rewards for those who have worked for him. “Blessed are the dead who die in the Lord from now on. Blessed indeed, says the Spirit, that they may rest from their labours, for their deeds follow them.” (Revelation 14:13). Reaching the end of a period of intense activity can be dangerous. I have never forgotten Alan Pascoe’s disastrous lap of honour at the 1974 Commonwealth Games. Having stormed his way to the gold medal in the 400 metres hurdles, he set out for a leisurely jog round the track to wave to the crowd, ran up to the first hurdle and promptly fell over it. Picked it up, went back to try again and fell over it again. Watch it on YouTube and take the lesson to heart. We’ve run the race, we’ve crashed through the finishing tape – now we may find that we stumble at the simplest task. We may find a huge disinclination to pray, to witness, to carry out the most routine duties. Everything may seem just too much trouble. Now is the time when we need to be most vigilant and self-disciplined. I quoted from the letter to the Hebrews a few lines back. This is how the writer continues: “And we desire each one of you to show the same earnestness to have the full assurance of hope until the end, so that you may not be sluggish….” (Hebrews 6:11-12). Remember King David’s most catastrophic fall came after a period of intense activity. Drained of energy and drive, David “in the spring of the year, the time when kings go out to battle” decided he couldn’t face it and stayed at home while Joab led the army out to war. (2 Samuel 11:1). His defences were down, and when he glimpsed Bathsheba from the palace roof, he was open to temptation. How careful we must be to guard our own souls, and the life of the church now. Satan knows only too well that tired believers are vulnerable believers. For myself and my family, these next few weeks may prove quite challenging. I’m due to go back to the hospital on May 6th for another keyhole operation on my knee. I may be out of action for a couple of weeks afterwards; it may be much longer. The surgeon doesn’t quite know what he’s looking for so can’t predict what the outcome may be: all we know is that the last operation seems to have caused as many problems as it solved. And then, twelve days after my op, on May 18th, our fourth child is due to come into the world. Of course he may be early or late. But at best, I don’t expect to be back to 100 % fitness to welcome him. And I don’t know how much help I’ll be to Anne before, during and after the baby is born. We’re very grateful that men from the church – and some from other churches – agreed to stand by to relieve me of preaching duties after the baby’s born. Those men will also need to be on standby for the weeks after the operation. More work for some of you, I’m afraid. Again, thank you for your willingness to lift the burden off myself. And many thanks to Anne’s parents who have volunteered to take Jesse and John off our hands for a week or so after the baby’s born. That will make so much difference. What a blessing it is to have them at hand. And yet, even with all the help, I have to say that the timing of events doesn’t seem ideal to me. It’s frustrating that my activity should be curtailed just when there are so many opportunities opening up. It’s frustrating that I won’t be able to give Anne the support I would want to. It’s frustrating that I’ll miss the Grace Assembly again at the end of May (James Goodman has agreed to go in my place to represent the church). If all the “times” had been in my hands, I think I would have arranged some dates rather differently. But how glad I am that they’re not. All my times are in His hands. Too wise to be mistaken He, too good to be unkind.